After two weeks on a hunger strike and putting pressure on hospitals, the Hunger Strike for Healthcare protesters finally sat down and met with University of Illinois Medical Center CEO, Joe Garcia on Monday June 18. In the hour-long meeting, Garcia agreed to certain demands that included reviewing the case of Lorenzo Arroyo. “They will begin an evaluation of his case and explore the possibility to be placed on a wait list,” said Father Landaverde of Our Lady of Guadalupe Mission. The Hunger Strike for Healthcare protestors insist on equal healthcare for all despite not having health insurance, sufficient funds or having a status as undocumented immigrants, which is the case of brothers Lorenzo and Elfego Arroyo. Both brothers suffer from primary amyloidosis, a genetic condition that requires a liver transplant. Elfego Arroyo was recently placed on an organ wait list with Rush University Medical Center where he is receiving treatment. 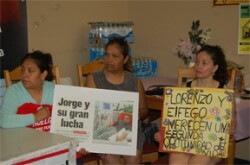 Father Landaverde said the hunger strike will continue despite some falling ill. Last week, 53 year-old hunger striker Catalina Arroyo and aunt of the Arroyo brothers was rushed to the hospital, but Father Landaverde said she is doing well and continues to participate in the hunger strike. Father Landaverde said the hunger strike doesn’t end with the Arroyo brothers and they will continue to put pressure on hospitals in hopes of helping those in need. “We want to be part of a network with Rush and Loyola to find a solution,” Father Landaverde said.